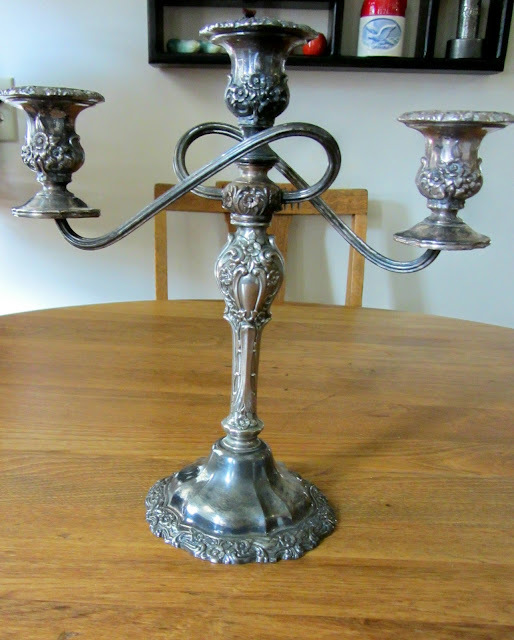 I am happy to report that I was lucky this week thrifting and found a silverplate candelabra and coffeepot. I still haven't run across that perfect sized silver tray I'm seeking, just very small ones. I love them! 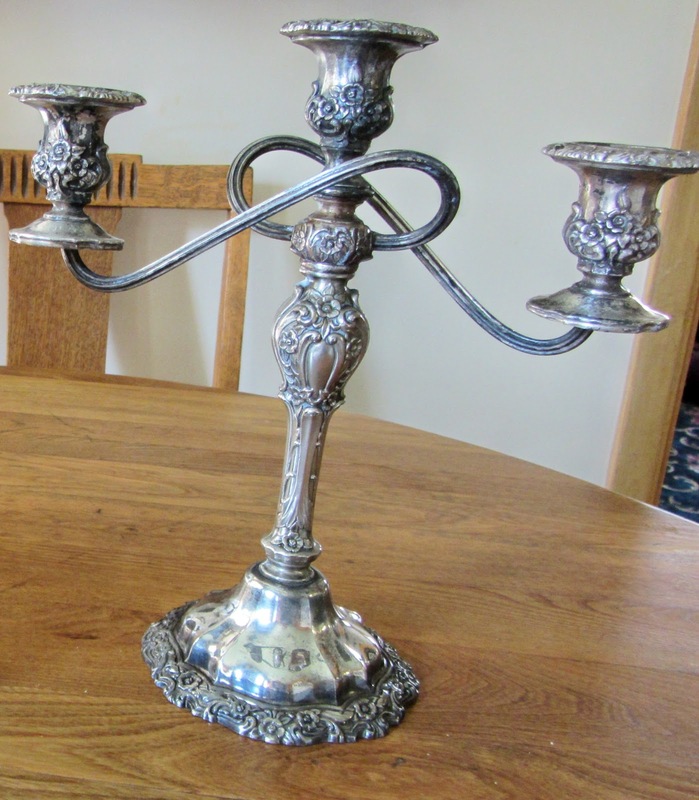 I paid $10 for the coffeepot and $8 for the candelabra. I remember in the last few weeks reading a post on Rosemary's Villabarnes blog about polishing silver with cheap dollar store whitening toothpaste. (Rosemary's post: http://www.villabarnes.com/2012/03/not-just-for-teeth.html). The toothpaste cleans up a lot of the tarnish, but the piece is left with some tarnish in the grooves and retains an aged appearance. I tried toothpaste on these two pieces. I want to do a maybe a little more cleaning than I did here, but I can tell I'm going to like the effect. Thanks, Rosemary, for the tip! It worked great! Nice deal, and they're looking good. Thanks for the shout out. Those are beautiful! That was a really good deal too. What great finds for such a little bit! Happy hunting for a tray. 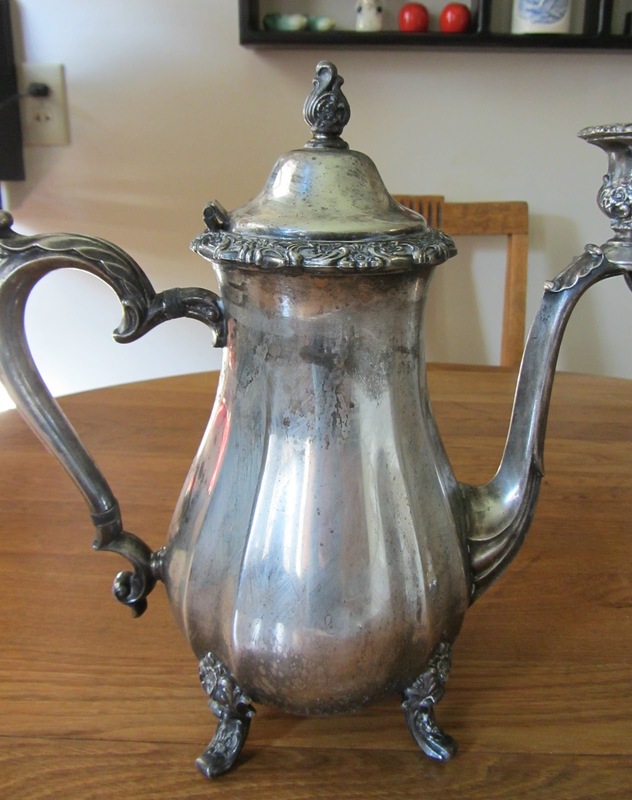 I have never heard of cleaning silver this way - pretty clever! And the 2 pieces are lovely - great finds! Isn't that candelabra GREAT.....love the twisted arms. What great finds at such low prices. I just found you over at Gina's Transformation Thursday and have enjoyed your blog so that I've just become your most recent follower. Please come visit and hopefully follow back at PICKINandPAINTIN.blogspot.com. THANKS. Thanks Candy. I have been following you for quite a while. I see you second on my blog list! They are beautiful and you are a lucky girl. Your pieces are beautiful, Never herd of the toothpast polish I am going to try it. thanks for sharing. Wow... that is a great tip. Can you imagine our grandmothers knowing that we are looking for a polish that leaves some tarnish?? he he Great price on your finds too! 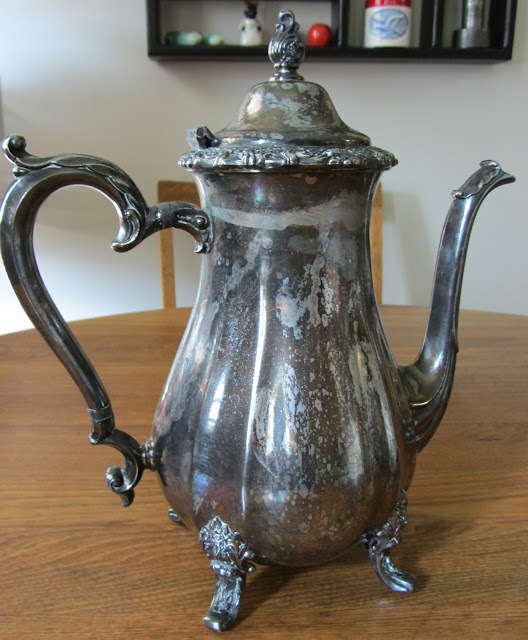 Oh, both of your silver finds are wonderful! I can't seem to pass up old silver so, I have a lot of pieces. These two are gorgeous! I have never tried toothpaste for cleaning them. Hum, I might have to try it. Thank you for joining TTF and I hope you are having a great day! Nice finds, you'll run across that platter when you least expect it! I am going to try the toothpaste on some of my pieces. Thanks for sharing this! Very nice pieces you got there! Thanks for the polishing tip - I'm going to get some tomorrow!